ReNu solution special offer: double-sized pack for free. Only until midnight! Thorough, yet gentle to sensitive eyes. 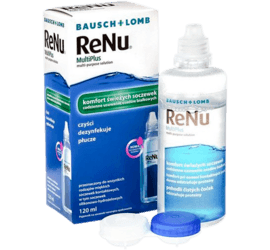 ReNu MultiPlus 120 ml solution will suit everyone. Try it out yourself – for one day only you can add it for free to your shopping. Plus – we offer it in a pack that is double the size you normally get! Versatile solution with prolonged hydration. Ideal for dry eye syndrome. Complex care for sensitive eyes, including balancing the pH of lenses. 86 % rating in customer satisfaction index. The offer is valid for one day only – 22 November 2017. For adding the Lilien gel to your shopping, please click the “Add gift” button.